McKenzie Long, shown earlier this season, was the runner-up in the 200m NB Qualifier race. Congratulations to McKenzie Long on her excellent performance at today's VA Showcase in Lynchburg. The Pickerington Central senior finished 2nd in the 200m New Balance Qualifier race with her time of 24.38. 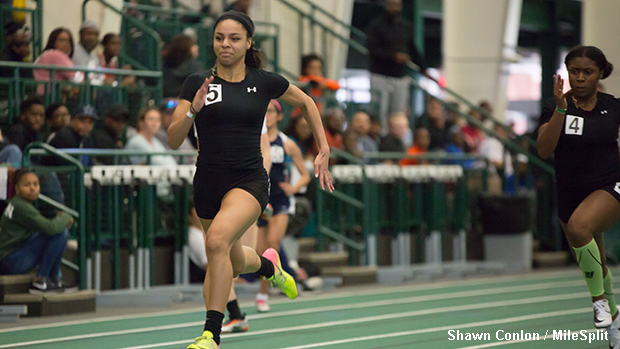 Long, who will compete for the Ohio State Buckeyes next year, was edged by Ashley Seymour of Bullis School (MD). Seymour captured the win with her 24.36 effort. Long's result represents an Ohio #1 for the 2018 season and a new personal record at the 200m distance (indoor).